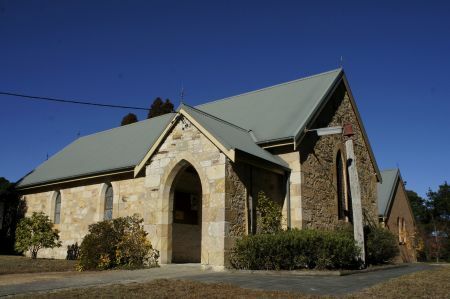 Although never an independent parish church, St Peter’s has the distinction of being the earliest Christian church in the City of the Blue Mountains. The church has had social significance to the Anglican community in the area for a century and a quarter. St Peter’s Anglican Church was built in 1874-5 on land donated to the church by Henry Bell. 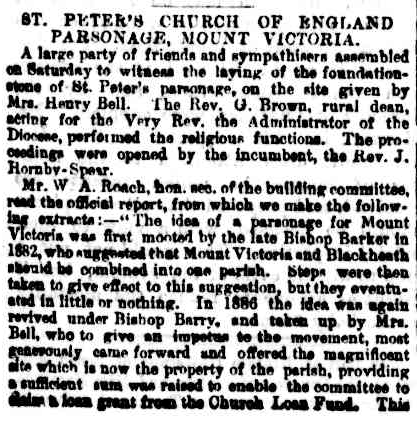 The foundation stone was laid by Bishop Barker on 18 September 1874 and the church was completed in 1875, the earliest church built in the Upper Mountains. The church was completed in 1875, the earliest church built in the Upper Mountains. The architect was David Macbeath and the contractor Alexander Armstrong. Its original affiliation was to St John’s Anglican Church at Hartley, opened in 1859. People have come together as community in the Church and its hall and grounds and still do. 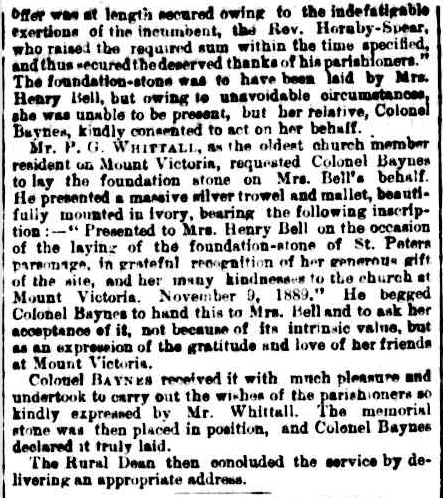 This article from the Sydney Morning Herald dated 10th December, 1889 describes a bazaar at the Church. Until recently, the Church Hall has had annual makeovers as the “Railway Refreshment Room” with former RRR workers re-enacting their former workplace in the Church Hall. The development of Blackheath and St Aidan’s church there in the twentieth century led in 1965 to the incorporation of both Mount Victoria and Hartley into Blackheath parish St Peter’s Church of England is a good example of a Victorian rustic gothic style church. Unlike many of the early churches in the Blue Mountains which were built of timber, the church is a solid sandstone building. Its simple form enhanced by the use of rockfaced sandstone set in lawn surrounds give a quiet, rural character to the site. Please treat this place and its people respectfully. This might be historical information, photos or more recent or current information. It can be about people who have lived at or been associated with St Peters Anglican Church, links to articles or information about structures at St Peters Anglican Church.